After fasting through the day, Sunni Muslims may break their fast as soon as the daily maghrib prayer begins, which is when the sun is no longer visible on the horizon (although the sky is often still quite light). Shi’ites wait longer, believing that their fast cannot be broken until the last rays of light have vanished from the sky. Regional variations may apply in both branches of Islam, however, so this is not an absolute distinction. See photos of ‘Id al-Fitr, the end of Ramadan. In other words: totally small differences definitely not worth fighting about. I urge Muslim around the world fast 12 hours from 6am to 6 pm every where you are—-you just set your time do not need to see the sun. I wish you a blessed and peaceful Ramadhan. When I will move to the arctic I will consider your suggestion. 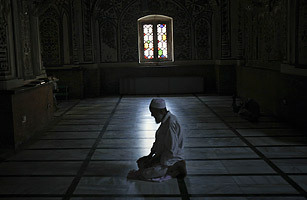 How Muslim pray 5 times a day? You do not need to follow the verses of Al Quran that sent down in Arab country where the length of day 12 hours and as well 12 hours the length of night. This is a proof that Islamic teaching can be adjusted or changed it according to the context of time, geograpic and tradition etc— that is why we call Islam is a religion flexible— do not make dufficulty to people— Islam is a religion of progressive—- only Arab clerics want to uphold their old tradition—they want to make all Muslim to follow Arab tradition as Prophet did. I urge Muslim please fillow Islamic teaching professionally according to the contect of time and the progess and development of Science and technology. Somi: are you fasting like that? for 12 hours? Bacon for Iftar with a little red wine may be? (As it has been declared healthy)?